Take a picture of the thing you want to give away. People can request it as soon as it's up on Forward, and once you approve their request, their contribution will go to the charity of your choice. You can browse Forward to find good stuff. When you find something you want, simply press the button to donate a small amount to charity, and pick up your item afterwards. 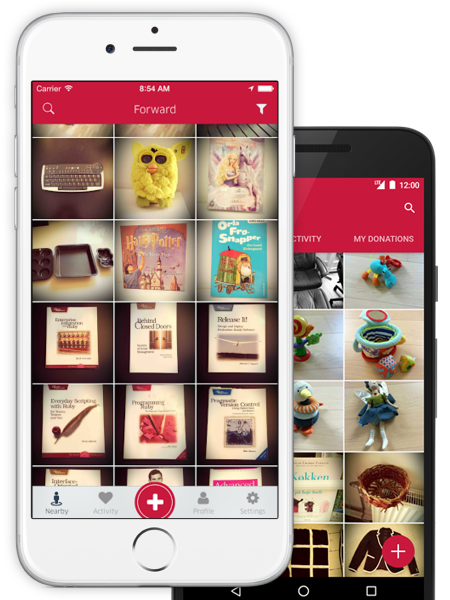 With Forward, you pay for things by donating to charity. You get stuff you want, and you do good while doing it. It's a win-win. You don't need to throw away your good, old items anymore. With Forward, you can easily give them away. The people receiving them will donate a small amount of money to a charity of your choice. Payment is handled inside the app. The first time you request a donation, Forward will ask for your credit card information. Once your request is approved, your card is automatically charged. No payment is needed when you pick up your item.